The Music Store Go! 15A is a multi-functional active loudspeaker with integrated 3-channel mixer, media player with USB connection and SD card slot, Bluetooth audio streaming, microphone connection (XLR), stereo line inputs and outputs as well as an additional powered output, on which a second passive loudspeaker can be operated. The Go! 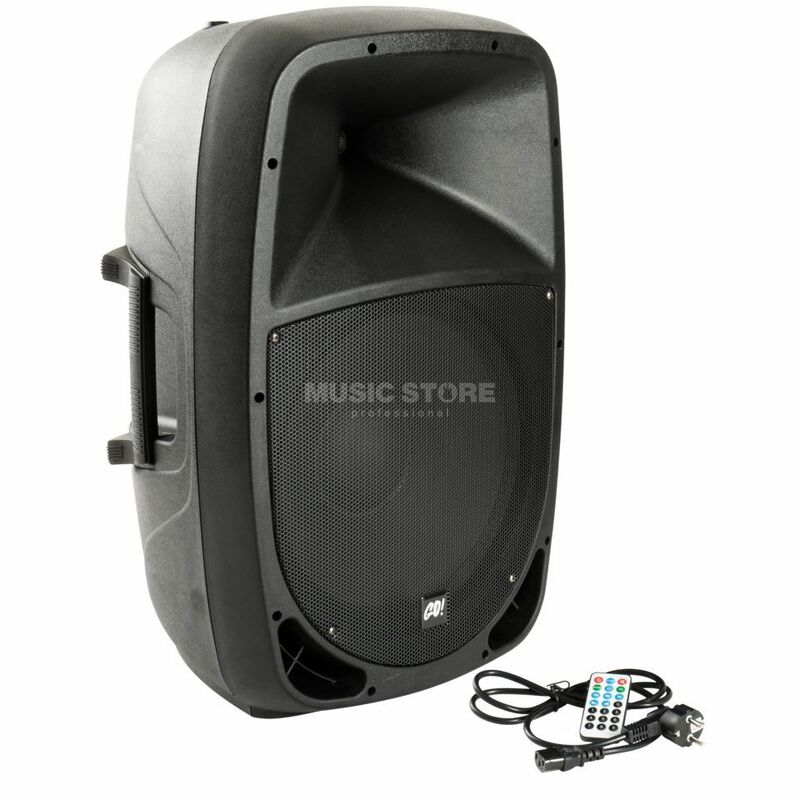 15A is equipped with a 15" bass woofer and 1" compression driver for a rich, professional sound. The built-in power amplifier has 700W peak power and enough resources to power another passive speaker (max. 200W/8-Ohm) via Speakon link out. The Go! 15A is the ideal mobile multimedia solution thanks to its integrated media player, which can read MP3 and WAV files from both a USB stick and an SD card. Thanks to its Bluetooth functionality, Go! 15A audio files can also be played wirelessly directly from a smartphone or tablet. The LCD screen and the control buttons below allow even larger file libraries to be managed clearly and easily and individual files to be selected. The Go! 15A is characterised by its high-quality workmanship, the housing being made of high-quality and robust plastic. The large carrying handles are integrated into the curved shape of the modern loudspeaker design. On the underside there is a 35mm speaker flange, which can be used to attach the speaker to any standard speaker stand. The Go! 15A is the ultimate multi-media loudspeaker, in no small part thanks to professional speaker equipment, full power amplifier, integrated media player, microphone, instruments and line inputs, in a variety of applications. Whether in seminars, for mobile presentations, as music and background sound reinforcement or as a mobile all-in-one PA amplifier solution for schools, musicians or as a Karaoke system for private parties - the Go! 15A has everything you need at an unbeatable price/performance ratio.